Supporting the SSC Educational Foundation demonstrates your interest in the College and your concern about providing educational opportunities for deserving students and assisting with capital projects at the College. 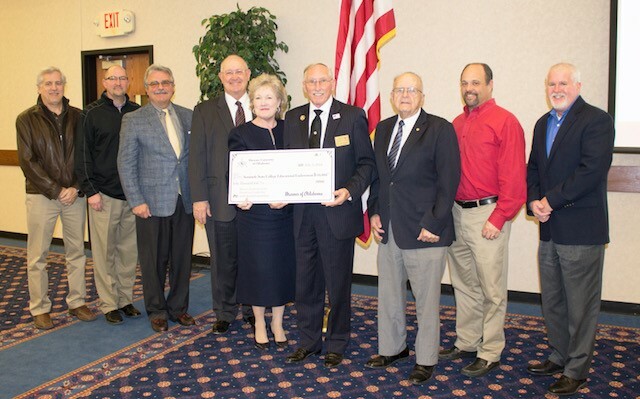 The Seminole State College Educational Foundation received a $50,000 Presidential Leadership and Cultural Programming endowment from the Masonic Charity Foundation of Oklahoma during a special presentation on Monday. This donation will help provide leadership opportunities for students at the College – specifically members of the President’s Leadership Class. The PLC program was established at Seminole State College over a decade ago. The two-year scholarship program provides approximately 40 to 45 students with unique educational, cultural, volunteer and leadership opportunities. Throughout the year, they are able to meet with state leaders, learn about state government and philanthropy, study leadership styles and participate in community volunteer work. This endowment will also fund cultural activities on campus that will be available not only to students, but to the entire campus and surrounding communities. Representatives of the Oklahoma Masonic Charity Foundation present at the event were Grand Master C.W. Corky Grigsby, Executive Director John Logan and President Ike Isaacs. This grant is part of efforts by the Masonic Foundation to place endowed funds in publically funded colleges throughout Oklahoma. For more information, visit http://www.mcfok.org. 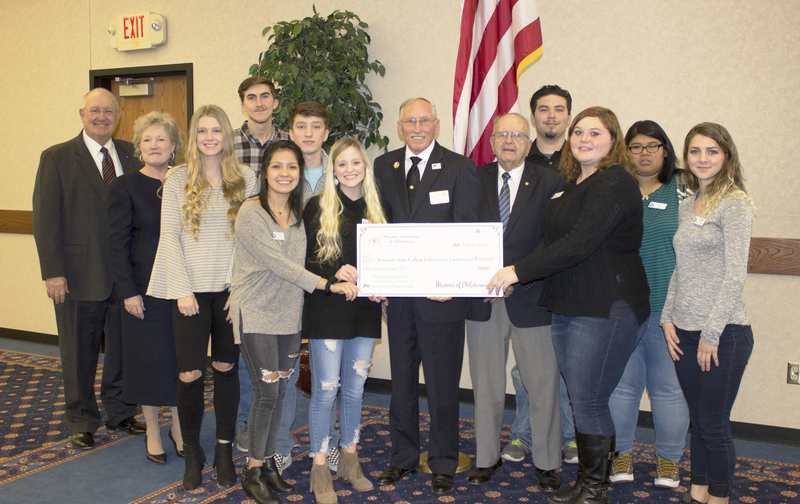 Supporting SSC Students Representatives of the Masonic Fraternity of Oklahoma pose with current members of the President’s Leadership Class – the scholarship program at SSC that will receive a portion of the organization’s $50,000 donation. Pictured are (l-r): John Logan, Executive Director of the Masonic Charity Foundation of Oklahoma; Lana Reynolds, SSC President; Breana Murphy of Choctaw; Gavin Winchester of Prague; Destanie Jacoway of Tecumseh; Wyatt Norton of Earlsboro; Hunter Dugan of Tecumseh; C.W. Corky Grigsby, Masonic Fraternity of Oklahoma Grand Master; Ike Isaacs, Masonic Charity of Foundation of Oklahoma President; Ernest Sego of Tecumseh; Kaitlyn Trunk of Okemah; Bo LeFlore of Shawnee; and Elizabeth Bond of Shawnee. A Special Donation Grand Master C.W. 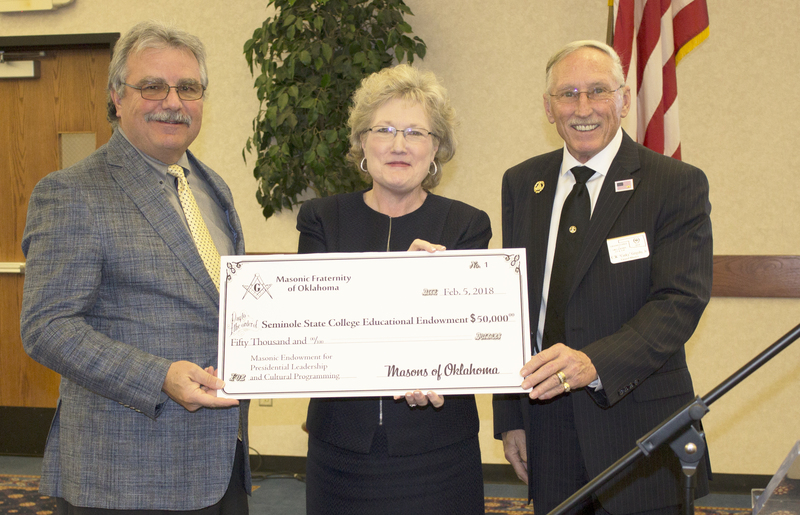 Corky Grigsby (right) of the Masonic Fraternity of Oklahoma presents Seminole State College President Lana Reynolds (center) and SSC President Emeritus Dr. Jim Utterback (left) with a $50,000 Presidential Leadership and Cultural Programming Endowment during a special ceremony on Monday.